IT is not often an England International goalkeeper arrives in Cleethorpes looking to resurrect his career but that is exactly what happened when Dave Beasant rolled into town in October 1992.
nightmare show against Norwich, where the Blues let a two-goal lead slip to be defeated 3-2, saw the giant stopper cast aside from the first team at Stamford Bridge. With a goalkeeping crisis of his own, wily Mariners’ manager Alan Buckley made a move for the former Wimbledon man and propelled the club into the national headlines once more as Beasant completed a loan move to the East Coast. The England custodian arrived at Blundell Park as the most experienced ‘keeper in the club’s history, having amassed over 500 career appearances to-date. He had also travelled to the 1990 World Cup in Italy with Bobby Robson’s England squad, having previously won two caps. Beasant’s Town debut was certainly on the big stage as the Mariners travelled north to his former club Newcastle. Previously unbeaten and one game short of their record for straight home wins, Kevin Keegan’s Magpies were running away with Division One. It’s 25 years ago since Beasant first donned a Town shirt and Jim Dobbin’s rocket silenced Tyneside. Of all the places to make a debut as a visiting player, the cauldron of Newcastle United’s St James Park is one of the most daunting. Add to the fact that Kevin Keegan’s side were one of the best sides to ever grace the second tier, embarking upon a seemingly unstoppable run of eleven straight wins from the season’s start, already nine points clear at the top of the Division One table and you could envisage the size of the task at hand for the Mariners. Nearly 30,000 vociferous Geordies packed the terraces in the famous ground with a small pocket of 900 visiting supporters crammed into a small corner in the roof of the stadium. Town had been hit by injury to first choice stopper Rhys Wilmot in the run-up to the game but manager Alan Buckley had an ace up his sleeve, pulling off arguably his greatest coup as Mariners’ boss in convincing England International Dave Beasant to join the club on loan from Premier League Chelsea. Beasant had already enjoyed a star-studded career, gaining national acclaim when he became the first goalkeeper to save a penalty in the FA Cup Final (from Liverpool’s John Aldridge) as he captained Wimbledon to a shock 1-0 win over the Reds in 1988. The Londoner would later travel with England to the 1990 World Cup but he had hit the headlines for the wrong reasons after being frozen out at Stamford Bridge following a nightmare game against Norwich where the Pensioners turned a 2-0 lead into a 3-2 loss. 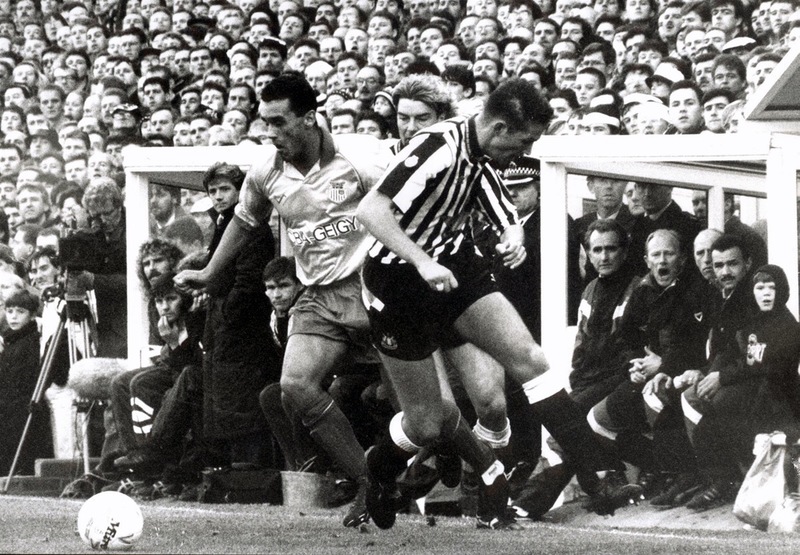 The former Wimbledon man was no stranger to St James Park, having joined the Magpies from the Dons in 1989, ending a nine-year spell with the Plough Lane club. And he was thrown in at the deep end, between the sticks as the Mariners took to the field billed as sacrificial lambs to the slaughter as Keegan’s side prepared to fire themselves into the record books. Trouble was that Buckley’s men had not read the script. They frustrated the Magpies in the opening exchanges with neat, patient passing and when the hosts did find a way through they found Beasant’s formidable frame between them and the net. Gavin Peacock was first to try his luck, turning neatly before firing straight at the new Town stopper. Beasant then did well to save from big Mick Quinn before Steve Howey fired the rebound over from close-range. The Toon were certainly not having it all their own way and Paul Groves fired a rasping effort narrowly over Tommy Wright’s crossbar. Peacock then deceived veteran Paul Futcher but again saw Beasant equal to his smart effort from 18 yards. Then, just after the half hour mark, the Mariners came with an inch of taking a shock lead. Wright couldn’t deal with a back pass from Barry Venison and the ball dropped to Jim Dobbin 40 yards from goal. The Town midfielder unleashed a magnificent effort, which cleared the stranded Wright but smacked the top of the bar and went to safety. The home fans were becoming agitated and their frustration was compounded on half time when Peacock wriggled free of the Town defence but saw his effort smothered by the omnipresent Beasant. Keegan had obviously rallied his troops at half time and they came out for the second period with renewed vigour. Within 60 seconds of the restart, Liam O’Brien had fired a 25-yard drive wide of the target, closely followed by a similar effort from Lee Clark. Town regained their composure though and should have taken the lead just before the hour. Dobbin dropped an inch-perfect ball over Howey but Clive Mendonca snatched at the ball and his effort cleared the crossbar. Futcher and Beasant then combined to deny Clark, who rushed through midfield into the penalty area. Beasant was finally beaten by a Quinn header in the 62nd minute but Dave Gilbert was on hand to clear the effort off the line. 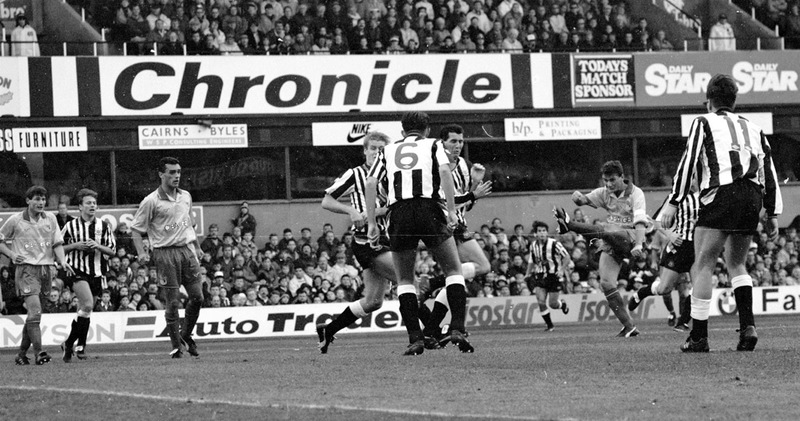 Newcastle were becoming twitchy and Tommy Watson got on the wrong side of John Beresford but saw Wright pull off a fine save. Keegan’s side were knocked off their stride and began aimlessly lumping the ball forward, although Beasant was alert to again deny Clark, before tipping another effort from the midfielder onto the post. Dobbin was again denied by the crossbar after brilliant link-up play by Mendonca and Neil Woods. The midfielder’s left-foot curler had Wright beaten but smacked the bar and Groves couldn’t get a vital touch on the rebound. The game moved into injury time and it was the small travelling contingent that were making all the noise. Astonishingly, there was one final twist in the tale and it was third time lucky for Dobbin on the afternoon. Mendonca was sent clear on the left-hand side and, with time running out, he laid the ball off for Gilbert. The diminutive winger squared for Dobbin, 30 yards from goal – the rest is Grimsby Town history. ‘Go for the corner’ was the cry from the Town bench. Dobbin did…the top corner, unleashing an unstoppable drive from far out that silenced the whole of Tyneside. ‘An Exocet missile’ was how radio pundit Danny Baker described the goal and Buckley’s men were national headlines for the weekend. TOWN: Beasant; McDermott, Croft, Futcher, Lever; Watson, Dobbin, Groves, Gilbert; Mendonca, Woods. Subs not used: Rees, M Smith.